Climate justice means a lot of work. There’s a lot to do, so let’s get started! We are glad about new people, who want to become an active part of our group, it doesn’t matter if you are experienced or have any qualifications. Diversity is a gain! There are enough different tasks to manage for everyone. Read our self-conception (down below) and write us: moin [at] gegenstromhamburg.de We will then invite you to our group-meetings. We are also glad to collect donations for further actions and the following repressions. We are a diverse anti-capitalist group and we see ourselves as part of a global climate grassroot movement. We fight for climate justice and radical climate protection. Through expressive resistance actions we fight for a good life for all. Therefor we need to build up a solidary, climate-neutral and environmentally sustainable bottom-up energy supply (among others) by overcoming fossil energy sources. Further we strive for overcoming any forms of discrimination, exploitation, oppression and injustice. Capitalism as a system, that bases on infinite growth and exploitation is neither sustainable on a planet with limited resources, nor does it match our expectations towards a society. We refuse any form of capitalism, more specifically so called green capitalism, because those systems legitimize oppression and only shift problems. We resist actively and do not only want to address the root-causes of climate change directly but also do not tolerate any attempts of Greenwashing. That’s why our forms of actions vary from public outreach to resistant actions and direct disruptions of climate-damaging processes. As a local group we are mainly active against hard-coal imports and coal-fired power generation. Our particular focus is on the local resistance against the power company “Vattenfall” as the biggest climate killer in Northern Germany. 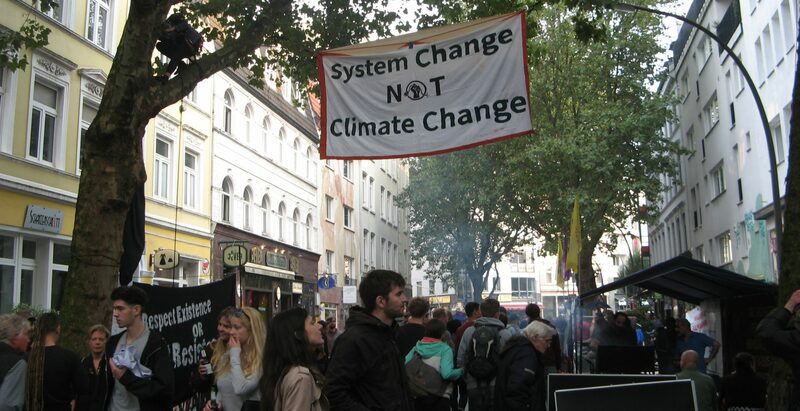 Beyond that we want to raise awareness for the connection between capitalism and climate change and contribute to the development of a resistant anti-capitalist climate movement. The unjust climate politics need to be denounced to promote a socio-ecological transformation. We stand in solidarity with other emancipatory anti-capitalist groups and individuals and see no reason or need to distance ourselves from of any thematic topics and forms of action.